Souters is a Microsoft Certified Academy that offers CPD Accredited Microsoft Outlook Training both in London and online. All of our programs lead to CPD Certification on completion. At present Souters schedules classroom training at our London IT training centre. They are fully CPD Accredited and certification is issued for successful completion. We offer Beginner and Proficient level classroom training, but you can request advanced, private or specialised programs. Our online Outlook training courses use a state of the art system. This involves a virtual tutor and a live server system. The online virtual tutor enables the program to instruct you and also to monitor your mistakes and correct you. It is like having your own personal Outlook teacher whenever you need them. This enables participants to still gain from personal attention and high quality tuition of a class, but also to have the flexible schedule that online training permits. You can choose Beginner Level, Proficient Level and Advanced Level. The training can be taken on 2007, 2010 or 2013 All of our online courses are fully accredited by the CPD Standards Institute and Certificates are issued on successful completion. This can greatly improve your employability and build the skills on your CV. Souters has developed specialist courses that target particular industries and the skills needed for that career. 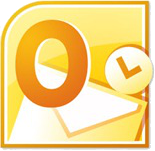 At present Souters offers online outlook programs that are designed for Legal Secretaries, Administrators, Medical Admin, Office Administrators, Secretaries, PAs, Office Managers and the list is growing. This is all offered online, using an interactive live server and virtual tutor. However, it is also possible to order these courses on a classroom, bespoke or corporate training basis, for those who prefer a face-to-face tuition environment. These types of industries that use a lot of Outlook, often opt to also purchase training in Word and PowerPoint. Our tutors are experts in their fields and they possess significant work experience using Outlook in their professions and not just tutors. Feel free to contact us about any areas or specialised courses that you or your company would like to see in a Bespoke or In-house Corporate Training Program.